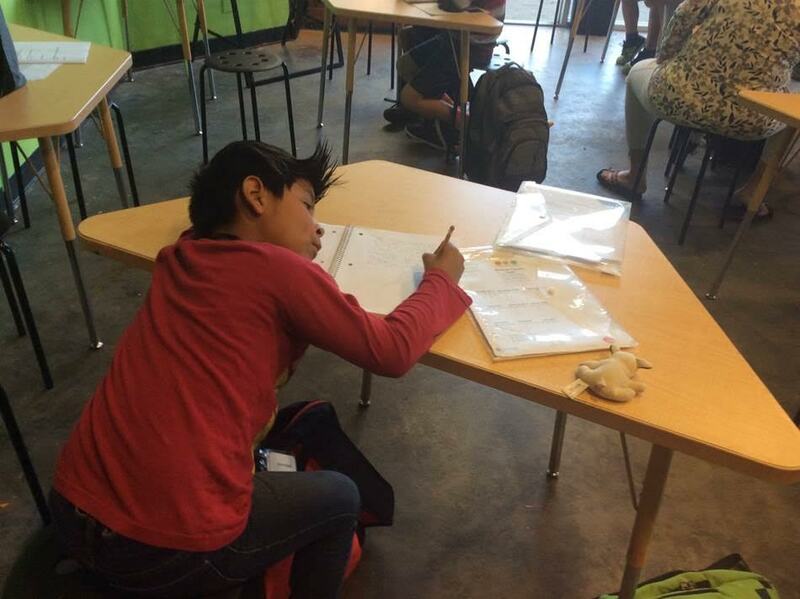 An afterschool writing center offers fourth- through eighth-graders the opportunity to explore their creative capacity, creating an open-ended and imaginative space for writing and reflection after school. Called the Chamber of Heart and Mystery, the portal has the aura of an old-fashioned curiosity shop, sans the dust. Staged as the study of an eccentric researcher, the room is overflowing with feathers, clocks, binoculars, and masks. The space is meant to stoke the imaginations of the fourth- through eighth-graders who visit every week and get them warmed up to spend the afternoon writing. Once inside the Word Lab, students receive a short lesson and a quick writing prompt from a teacher, but what they do with the rest of their time is largely up to them. They are encouraged to write whatever they want, be it a personal narrative or a fictional story. This open-endedness is deliberate. At the Word Lab, students are granted a rare level of agency and trust. When students are given that freedom, Word Lab creator Julia Chiapella and her staff believe they become more creative, self-reflective, and confident. For the Word Lab participants, many of whom are from low-income Latino immigrant families, the opportunity to cultivate their own voice is a powerful one they might not get elsewhere. “They’re being given the license to explore on their own rather than have their writing dictated to them,” Chiapella said. The Word Lab, located at the Santa Cruz Museum of Art & History, is a project of the Young Writers Program, a nonprofit that grew out of a partnership with the Santa Cruz County Office of Education. The Young Writers Program works inside many local public schools, but director Chiapella and her colleagues, inspired by 826 Valencia—another afterschool writing program accessed through a portal—always envisioned running an afterschool writing program in a separate space. When they received a 2015 LRNG Innovators Challenge grant and other donations, the vision came to fruition, and the Word Lab opened in early October 2016. The LRNG grants stem from a partnership between the National Writing Project and John Legend’s Show Me Campaign to help educators extend time and space for connected learning. With the LRNG grant, the lab is partnering with three local elementary schools. Teachers from each selected 15-20 of their students to participate in the program. “One of the primary things we offer that schools are unable to offer is one-on-one attention,” said Word Lab director Mariah Goncharoff. The lab is staffed by Goncharoff, credentialed teachers, and a number of volunteers. The staff offer regular writing prompts to students to get their creative juices flowing, and provide one-on-one support. Some students have embraced personal narratives, but they can write about whatever they want—so sometimes that is going to be “a pink pony going into outer space,” Goncharoff said. Of course, a pink pony is not always just a pink pony. Recently, a participant wrote a fictional story about a young girl whose parents were going through a bitter divorce. When talking about the story, she would subconsciously switch between referring to the main character as “she” and “I,” Goncharoff said. The quick-write exercises at the start of the day help warm up the students. Sometimes they make use of the curiosities in the portal. One teacher brought in a box of keys and distributed them. She had the students imagine they had stumbled on their key in a forest and write about where it had come from. Ultimately, Chiapella said, writing is a democratizing tool—both in the sense that it can give underrepresented students a voice, and can be used to effect change. The program will culminate in the publication of the students’ work in an anthology, which the participants will type and edit. It will be sold at a local independent bookstore, Bookshop Santa Cruz, where the students will also give a reading at the end of the year.